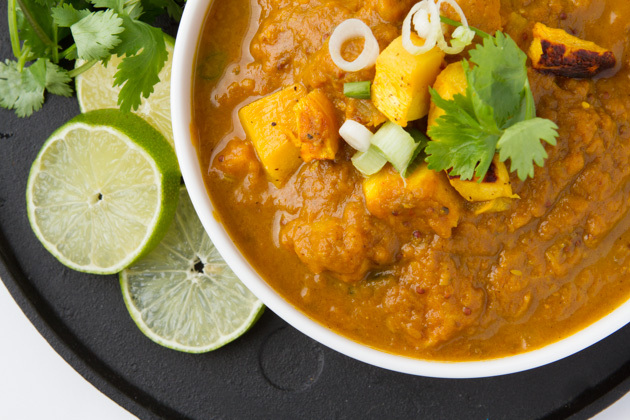 A spicy pumpkin-based curry with pureed pumpkin, roasted pumpkin cubes and a coconut milk and vegetable-based broth. No tomatoes, grain-free and ultra soothing. 1½ cups canned pumpkin puree – not pumpkin pie puree! Preheat oven to 400F and cover a baking sheet with parchment paper or a silicon baking sheet. Add cubed pumpkin, 1 teaspoon of grape seed oil and a sprinkle of salt and pepper to the prepared baking sheet. Stir around with your hands until covered. Bake in preheated oven for 20-25 minutes, rotating halfway through. When complete, remove from the oven and set aside. Meanwhile, add 1 teaspoon grape seed oil and sliced onion to a large saucepan. Saute, on medium-high heat for 10 minutes, adding a total of 2 tablespoons of water throughout the cooking process to avoid burning the onions. Add ginger and garlic and continue to cook for 5 minutes. Add pumpkin puree, reduce heat to medium-low and cook for 10 minutes, lid off. Stir every couple of minutes to make sure nothing is burning. Add vegetable broth, coconut milk, cumin seeds, turmeric, paprika, salt, mustard seeds and curry leaves. Cover and bring to a boil. Reduce heat to low and simmer for 15 minutes. 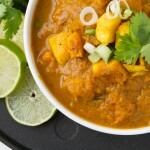 Stir in curry powder, lime juice and roasted pumpkin cubes. Cover and cook for another 3 minutes, just until heated. Serve with fresh cilantro. Pumpkin – cubed pumpkin can be replaced with an equal amount of cubed butternut squash or sweet potatoes. Cubed, the pumpkin was about 3 cups. Grape seed oil – feel free to use whatever you’d like to here. Coconut oil would be nice. Spices – if you don’t have all the spices, that’s okay. Replace extras with another 1 tablespoon of curry powder.